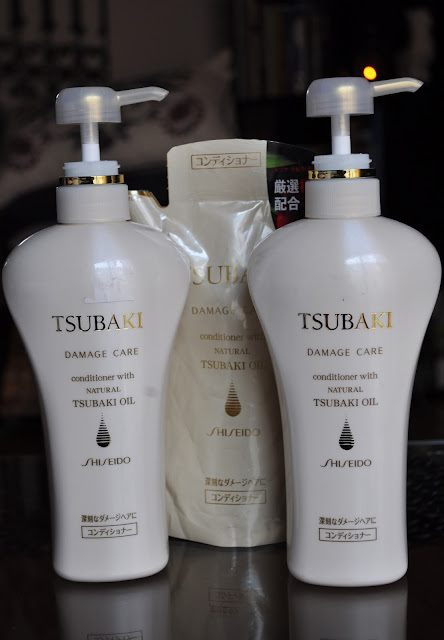 Shiseido's Tsubaki Damage Care Conditioner: With summer underway, I tend to go au naturel and leave my hair curly. It's just too hot to blow dry my hair, and with the high humid, all my efforts are spoiled as soon as I walk out the door. Leaving my hair curly means washing it everyday; and although I don't shampoo it everyday, I slather on the conditioner. Shiseido's Tsubaki Damage Care line is the only drug store brand that keeps my hair soft, shiny and moisturized. As long as I live in Japan, I'll always repurchase. Skintimate Moisturizing Shave Gel Flirty Mango: Skintimate's Shave Gel is the only thing I'll use to shave my legs. Will always repurchase. 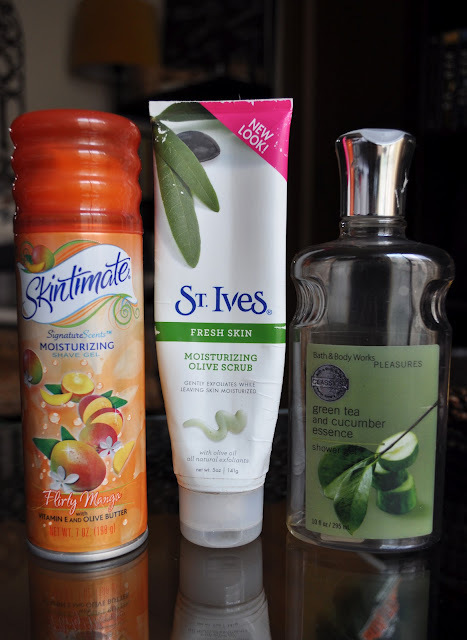 St.Ives Moisturizing Olive Scrub: I love St.Ives's scrubs, but this one was a disappointment! I felt the olive scrub didn't have enough microbeads (in my opinion), therefore, not doing a great job in the exfoliating department. I'll repurchase scrubs from St.Ives, but not this one. Fekkai Advanced Brilliant Glossing Cream: I used to use the entire Fekkai Glossing line, but I've moved on. I used this cream after deep conditioning my hair. Fekkai's Advanced Brilliant Glossing Cream did add extra shine to my hair, but that's about it. I won't repurchase. La Sana hair essence: I purchased this serum while I was on vacation and found that I had forgotten my finishing gloss. This did nothing for my hair, and unfortunately I have one more of these little bottles to use up. I definitely will not repurchase! 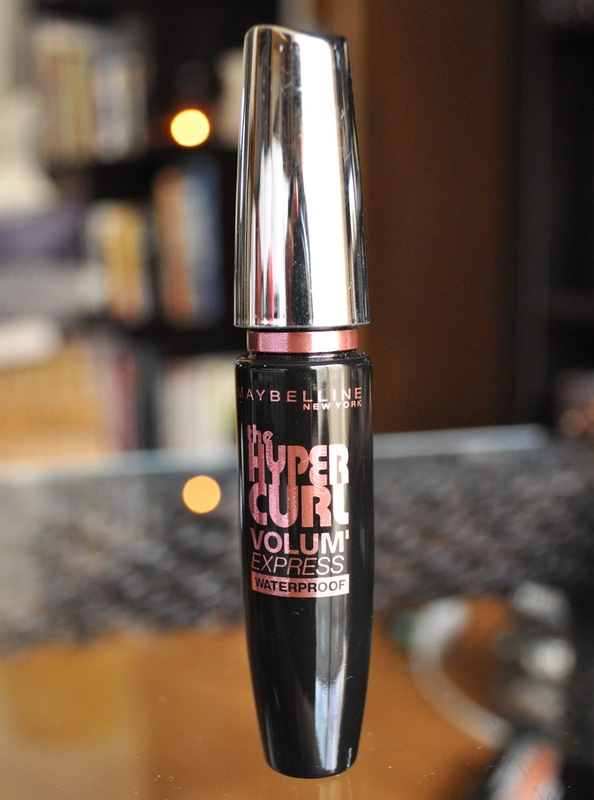 Maybelline The Hype Curl Volum Express Waterproof Mascara: I'm done with this mascara and I will not repurchase...enough said! If you want to know more, feel free to read my review of this mascara. 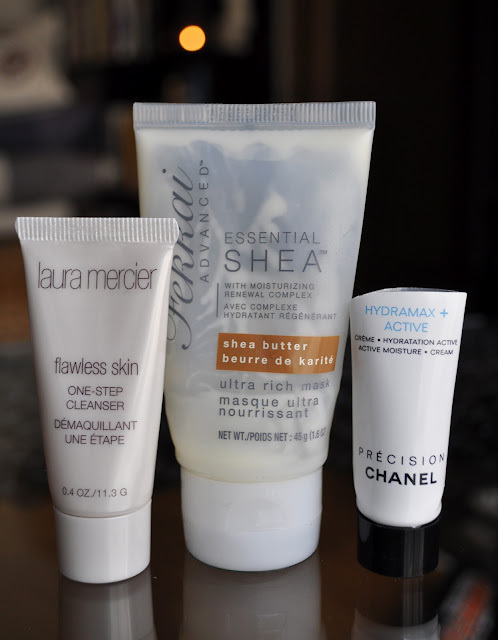 Laura Mercier Flawless Skin One-Step Cleanser: I love Laura Mercier's beauty line, but her skin care left a lot to be desired. The Flawless Skin One-Step Cleanser left I feeling unclean. I wouldn't be the full size of these cleanser. Fekkai Advance Shea Ultra Rich Mask: I've purchased the full size of this mask before and I love it! The Shea Ultra Rich Mask leaves my hair feeling soft and moisturizing. I will continued to always repurchase. Chanel Precision Hydramax + Active Active Moisture Cream: This was given to my with a recent Chanel Purchase at Odakyu. I really loved this facial cream, and I was surprised at the two weeks worth of product that was in this little tube. I can't wait till I've gone through all my moisturizers to repurchase! Peter Thomas Roth Anti-Aging Cleansing Gel: I really liked this cleanser. it left me skin feeling soft, clean and moisturized. I would repurchase. 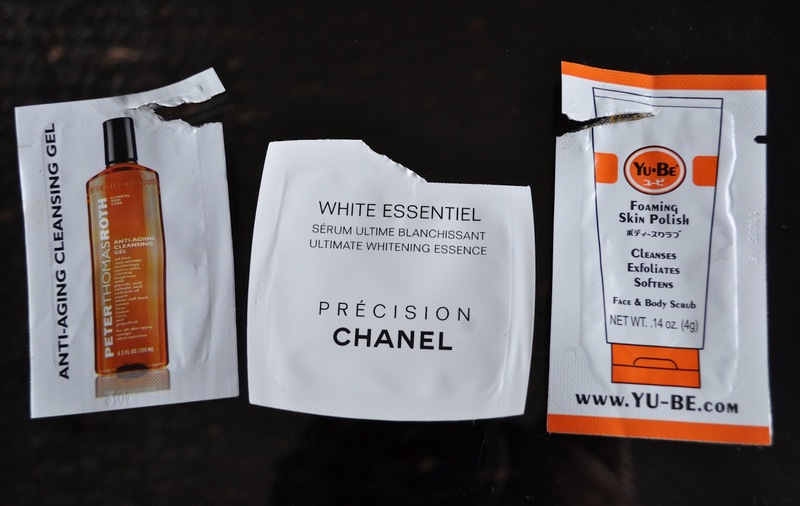 Chanel Precision: This packet gave me about 3 days of product. I enjoyed this serum, and would repurchase. Yu Be Foaming Skin Polish: I loved this exfoliating polish, but I most warn to it is a bit rough in regards to the microbeads. Once I'd done with my supply of exfoliators, I will repurchase. Have you tired any of the products featured in this post? I'm so glad to be done with this mascara! I'm on a no mascara buy, until I've gone through the million that I have. I like the tsubaki gold n red lines, never tried the white ( except the white treatment spray) do u think ie will suit the super humid n hot weather in hong kong? I hv thin ( little amount) and fine hair! I would stick to the gold and red lines then. The white may be too moisturizing and weigh your hair down and make it look thinner. I want that mascara- sounds like a great purchase. Really, I love it! but my skin is pretty tough!